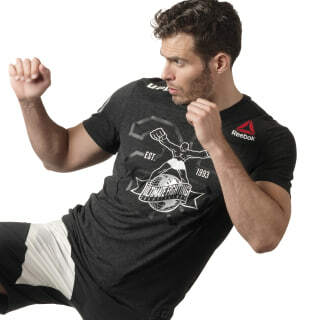 Show your support for your favourite UFC fighter with this men's Official UFC Walkout Jersey. Mélange fabric offers smooth comfort on Fight Night or after. The 'We Are All Fighters' neck tape and authentic reflective jock tag play up your love for the sport while the slim cut offers a traditional and familiar fit.